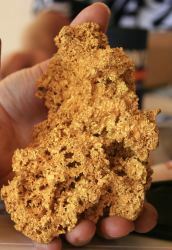 Udo has his own gold leases at Mindoolah near Cue in WA and has been a using metal detectors in WA since the 1970's with outstanding success, the 22 ounce nugget above is one of the many he has found. This website shares our knowledge of gold prospecting with you so you can get out there and give yourself the best chance to find gold. With tips and reviews on the best equipment to use - so you dont make expensive mistakes. You will get local information about places to detect so you don't waste time and money travelling to detect areas that are totally barren. If you are anything like us you love travelling around this wonderful country but money is pretty limited. You are probably hoping to find a few nuggets to pay for your trip or maybe with a bit of luck find the once in a lifetime nugget that you will be able to retire on. But you are not sure exactly where to go gold prospecting and you don't want to waste a lot of money travelling to the wrong spots or buying the wrong equipment. We want you to have the information to find gold quicker without breaking your limited budget. You don't want to waste valuable fuel by travelling all over the countryside looking for that first piece of gold. It easy to make expensive mistakes by purchasing the wrong equipment or poor equipment for metal detecting. Particularly when you look at the new metal Detectors like the Minelab 5000 which will set you back over $6000. Not to mention the after market gear that you need to clean out ALL the gold from your find. We will give you our views on what it the best new and second hand equipment and places to purchase or rent your equipment. That way you can make sure you don't make any expensive mistakes, buy tools you don't need or see the same gear much cheaper later on. We will do the time consuming, grindingly boring research for you. We will pull together locations reports based on our research and many years of local knowledge so you can save heaps of time and money but still get all the knowledge you need insimple, plain English. You also will find all the information you need written about Australian conditions and rules not remote US websites and obscure blogs. Do you know the rules about prospecting in West Australia? You must be clear on the rules so you don't get into trouble. All you want is an enjoyable and hassle free experience without breaking the law. Who wants to keep looking over their shoulders when they are out the bush prospecting? No-one! But, it can seem like a nightmare of complexity trying to negotiage government regulations and rules. We have simplified the rules so you understand them more easily and we provide links so after you understand what you need to do you can obtain the forms and documents you need to ensure you are within the rules. We will regularly update any changes to the rules through the monthly Gold Prospecting and "Special Bulletin" e-zines so you can be sure you are up to date on changes. We want to develop a complete one stop solution for all your gold prospecting and metal detecting information so you dont have to seach the web a hundred times a day just to get the information you require. If there is something YOU would like included that's not yet on our site we want to hear from you. Just complete this form and we will contact you and research/develop the information you need. You wont have to be to be a internet or techno-guru or geek to understand our website we will make it easy for you to find the information you want. We have tried to simplify everything and make is easy to understand so you dont have to be a techno geek just to find out the information you need to know to successfully and legally find gold. Yes, Free....so you don't have to bust your budget to get the best easy to access information about Metal Detecting For Gold in Western Australia.